The following story appeared in the Dec. 12 edition of the Mankato Free Press. 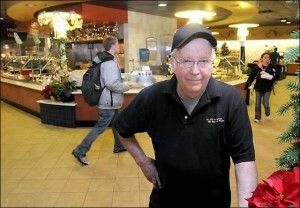 Steve Brown recently received his college degree at age 70. Photo by Pat Christman of the Mankato Free Press. Steve Brown wasn’t about to fold his tent when he was dealt a triple whammy a decade ago. That’s why the 70-year-old deserves to hold his head high today when he not only graduates from Minnesota State University but speaks to the assembled crowd as well. “Life is 10 percent what happens to you and 90 percent what you do with what happens to you,” Brown says. His domino effect of personal setbacks began in 1998, when he had both knees replaced, followed a few months later by a stroke. The third indignity came when his doctor bluntly told him the time had come to put himself out to pasture. The native of Huntley, near Fairmont, entered the armed services after high school, then spent his working years as a printer and a chef. Rather than sidling into retirement, his physical challenges steeled his desire to remain productive. He was hired as a food service worker at Gustavus Adolphus College in St. Peter and took his resolve a step further by enrolling at Minnesota State. He says his children were stunned. He says they didn’t think he would last long as a college student. Truth is, neither did he. He began taking classes in 2000 — one here, one there — to test the waters of higher education, and things went swimmingly. Then one day during his second or third year at MSU, he was walking in Armstrong Hall when he espied some wall posters. “He thought they were groovy and he decided to become a geography major,” says MSU Geography Department Chairman Don Friend. The posters depicting various nations flipped a switch within Brown, and in MSU’s Bresnan Arena today he’ll receive the fruits of his matriculation. He gives thanks to his MSU instructors and particularly lauds his supervisors at Gustavus, who enabled him to tailor his work schedule around his class sessions. Friend says the MSU Geography Department’s most non-traditional student is soft-spoken, humble and loves learning for its own sake. “He’s thankful for, one, still being on the planet and, two, for the education that has been provided for him,” Friend says. At each MSU graduation several students are selected to give short speeches. Brown’s address will last two minutes, tops. That’s not a lot of time. Then again, words from the heart don’t require filibusters. Congratulations. You are a true inspiration to us all! Never stop learning! Way to go, Steve!! You are a winner and I applaud you. Wow, what a nice, inspiring story for the Holidays. Our Congratulations to you, Steve, on a job well done! What a wonderful inspirational story. Steve also provided the workplace with a funny sense of humor. He understands that it’s important to never stop learning. Yea Steve!!! Knuckles for Geography! Steve is an amazing individual. I worked with him while I was an international student at Gustavus. Interestingly enough, he helped me go through college by offering to buy my books (organic chemistry, cell and molecular biology, calculus, and other literature text) during sophomore year. Steve has a kind but determined heart. I currently work at the Mayo Clinic and plan to start medical school August 2010. CONGRATULATION STEVE and you continue to inspire me. Bless your heart. Congratulations Steve, your story inspired me and I thank you for that. You have taught many people the other reason for getting a higher education, simply to expand ones knowledge for the satisfaction of it, money should not be the only reason we go to school and learn. Yea Go Steve! Wish we were still there to congratulate you in person, but we are hung up in New Zealand:)! Hope you are still cheering on your favorite gustie hockey team! Way to Go Steve! I knew you could do it! Are you still playing in the Jazz band too? Kristina Campbell (’02) Caf buddy!